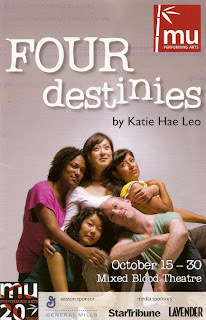 Four Destinies is a play about the life of four adopted children in the same family - a sort of Sliding Doors alternate universe exploration of what would have happened if the parents had made different choices about adoption. Local playwright Katie Leo has made herself a character in the play (played by Katie Bradley, who's a funny and natural host, with some more emotional moments towards the end), narrating, observing the action, and at times even interacting with the characters. She loses control of her own creation as her characters' lives don't turn out as she expected. The first act of the play is the same scene, celebrating the child's adoption day anniversary, enacted in four different scenarios. The family repeats the same silly small talk, which becomes funny as by the fourth time the audience knows what's coming. Shanan Custer as the neighbor and close family friend is particularly funny; I only wish she had more to do (she did a very funny skit at the Iveys last month). In the four scenarios the child, whom the parents named Destiny, is adopted from Korea (Sara Ochs, aka Audrey in Little Shop), Guatemala (Nora Montanez), the US foster system (LeDawn James), and a local young woman who gives her baby to the Jones family at birth (Neil Schneider). The four kids are at different ages (from 8 to college age) and different stages of accepting and embracing their past. One little girl is afraid someone is going to come and take her away, despite her mother's assurances that she's "meant" to be with them, while another older Destiny takes back her heritage and her name. The only white child is also the only male; he loves to play with dolls and wear dresses. When his friends question the boy's behavior, the father (Nicholas Freeman) is sweetly defensive of his son, while in the other scenarios he's fairly distant, preferring to watch the football game rather than interact with his family. In the second act, the playwright (who's also bought a DNA kit that promises to unlock her genetic history and solve all the mysteries of her life) plans to give her characters everything they wanted. But that doesn't happen in life, or in this play either. One Destiny travels to Korea and is unable to find her birth mother or any sense of connection. One grows up to make movies like she always dreamed, but her family medical history catches up with her. One has a successful career, only to end up unexpectedly pregnant and facing the same issues her birth mother faced. The male Destiny calls his birth mother (Shanan Custer getting to flex her dramatic muscles) and finds "the story" not what he imagined. Finally, the playwright doesn't find any answers in the DNA results. Where does this leave us? This is one of those open-ended plays where nothing is resolved. But maybe that's the point. At the beginning of the play, Katie the character jokingly claims to speak for all adoptees because they all feel and experience the same thing. That's obviously not true; instead Katie the playwright presents four very different experiences, all in the same family. She brings up interesting ideas about fate and what's "meant to be." I'm not sure I believe in "meant to be;" I believe in what is. That's really all we have to cling to.